Executive summary: On the one hand, I did my slowest Half Marathon time in 2 and a half years, on the other hand, it was only a minute slower than my best time. Let's get the excuses out of the way, because they serve no purpose: it was hot and windy, I had a cold coming on, my back was painful, I trained for the wrong distance up until a month before, the race was in the afternoon and I was tired from travelling. Now that's off my chest, perhaps instead I can learn from something I did wrong because that is the point of all this, to advance in performance or experience or both. I booked a hotel that turned out to be in the middle of nowhere but I had chosen it to be near the station, so that it would be easy to get to and from the Hague. It would also have been cheap (€4.50) to get to from the airport but I felt so tired after the flight I decided to get a taxi - after all, how much more expensive could it be? 10 times, is what! Oh well, lesson learned. Staying in Amsterdam presented me with somewhat of a dilemma. One of my favourite deejays was playing on the Saturday evening and the race was starting at 2:30 the following afternoon but it seemed silly to go so far to try for a personal best in the Half Marathon, only to be knackered from partying the night before. After all, I was only looking to shave 4 seconds off my time. If there is an intersection between my previous life of a deejay and my current life as a runner, it is this: drum 'n' bass music, which is the perfect rhythm to run to. The weather was absolutely beautiful and you could tell that it was unusual for this time of year as everybody was talking about it and the Dutch were out in force on their bikes. I had a light breakfast on Sunday (perhaps I should have had a heavier one, who knows?) and got chatting to the barman, who turned out to be an ex-professional footballer who was also quite a fast runner. Getting to the Hague couldn't have been much easier - there was a train leaving just as I got to the station and bought my tickets. I traveled very light, just carrying what I needed for the race itself with a change of clothes on top. So light, in fact, that I forgot to take the map of the race area or any kind of ID. This didn't turn out to be a problem. I hadn't realized what a huge spectacle the race would be: there was a huge throng of people making their way to the nearby park which had been converted into a massive staging area for the races taking place. 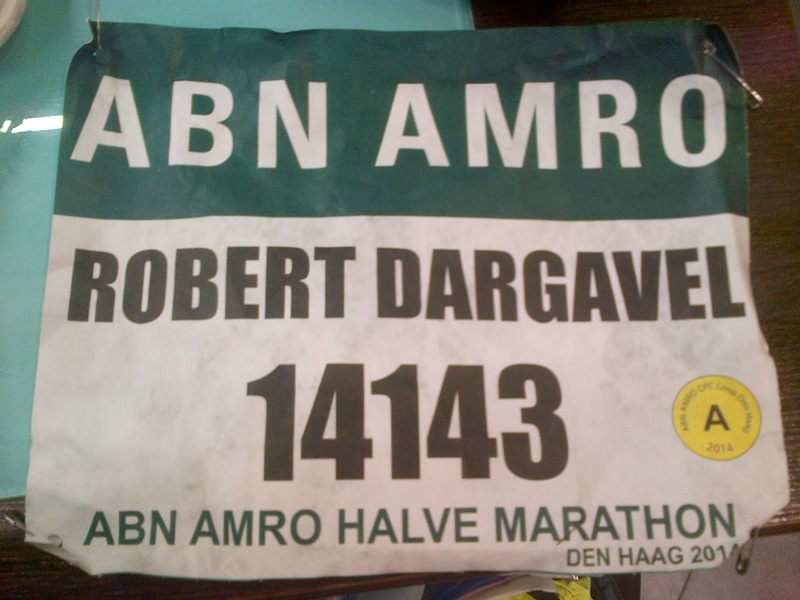 I was handed my race number without any questions asked, so much for me fretting about it. In fact the atmosphere, if anything, was a little too relaxed. The event was very much aimed at two distinct groups: fun runners and the elite, so that "competitive runners" like myself fell between two stools. For example, the only food available was junk food (although I did manage to find a cheese sandwich) and it was pretty much impossible to warm up as there was no area set aside for the runners away from the meandering crowds. It was also strange not to see the usual stalls selling gadgets, gear and energy bars to runners all too happy to part with their cash. Having said that, it was perfect for hooking in people new to the sport. I think my Vibram SeeYas attracted even more attention than usual with such a casual crowd (although not quite as much as my Pulpo Paul costume) - I was even asked to pose for several photos with them. The start was a very Dutch affair with the compere even singing some karaoke song that everyone else seemed to know. Sandwiched between the fastest corral (sub 1:30) and the elite were a bunch of Dutch runners competing for some national title. Unfortunately, some of them were very slow so that, when the gun went off, it was a bit chaotic. It took me a while to find my space and get my rhythm. A rhythm, as it would turn out to be, a bit overheated. I'd thought that "Loop" meant loopy as it was a very twisty and turny course but in fact "loop" means course in Dutch and "lopen" means run. Also, because Holland is very bike friendly, the roads are relatively narrow with wide pavements and bike lanes. This meant that people cut some of the corners although it wasn't very clear whether the measured course was counting on this or not. Certainly there was one occasion when a policeman suddenly decided to stop us from mounting the pavement just after a whole slew of other runners had done so. As it was quite windy and it seemed like the wind would be in our faces on the way back, I decided to try and bank some time. By my calculations, I should aim for 3:42 per kilometer and 18:30 every 5km. I got to the 5k mark in 18:09 (which, by the way, more or less equals my personal best time of 18:05 for 5k from this time last year, since beaten by 30 seconds) which would have been in line for a 1:16:36 Half Marathon time! In retrospect, I think this is where I made my error - I simply started off to fast and then faded gradually during the race. I enjoyed the first half of the race: I was still on target by 10k (37:04) but, of course, the pace I was running at was now as much slower than my target as first 5k had been too fast. The crowds were a bit "soso" as we say in Spanish (wet, I guess). A few times I called out for them to cheer and a brief round of applause ensued. Occasionally I heard my name being shouted but, as they had also put my middle name on the bib, very few had time to read it. I did wonder whether my childhood friends and the friends of my parents were out there, as well as whether they would recognize me - not very likely, as I hadn't warned them I was coming. The only part of the Hague that I recognized was Scheveningen beach but by that time I was beginning to realize that it was going to be very difficult to meet my goal of breaking 1:19. The splits were coming in in the 3 fifties and I knew I would have to at least run 3:45 per kilometer. As was to be expected, we were more spread out by now and it was harder to find shelter from the wind which was now in our faces. For a brief moment I thought that I would make it but, in hindsight, I must have done my sums wrong because the time that I was on the borderline of breaking was 1:20, not 1:19. It's a silly thing but, if I regret one thing, it's that I didn't make that extra effort to break 1:20. I didn't exactly take it easy but, having seen my goal evaporate, I didn't have the fight in me to be able to clock in another sub 1:20 time. My initial reaction when crossing the line was to feel angry at myself and even to feel guilty, having spent all that money just to get the opportunity to run a fast flat course at sea level and to have "squandered" it. Maybe the heat and the wind cancelled out the advantage afforded by the profile - it's often the way that a flat land has higher winds, not to mention sea breezes if it is literally at sea level. Now I realize that the error was in running the first 5k far too fast: a Half Marathon may not be a Marathon but it doesn't mean you can muck around with it. In spite of this tactical error, I did manage not to fade too much and I certainly didn't have that horrible feeling of people passing me by. For this, at least, I think I can feel proud. 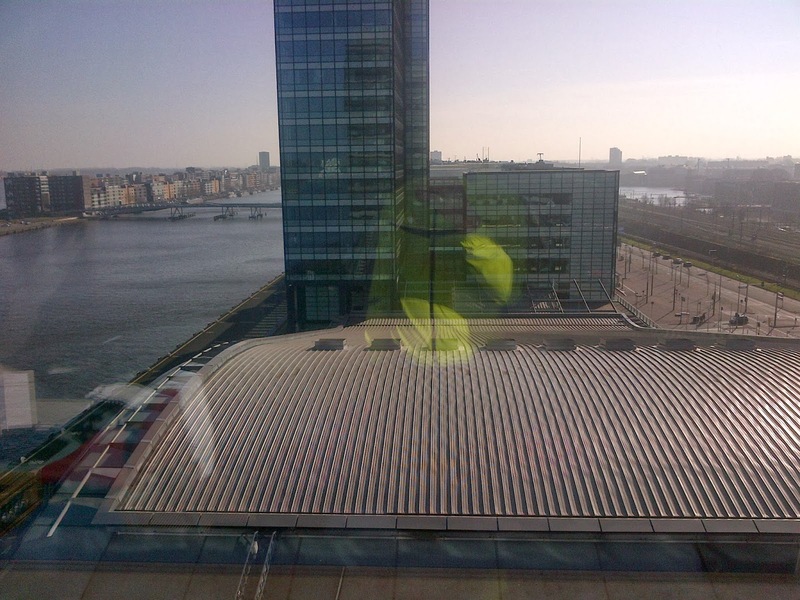 It was nice to get a medal, especially from ABN Amro where I used to work for 6 years. It's not often you get a medal from your employer, even if it is 13 years late. After the finish line I lay down for a bit but this seemed to worry the officials as it wasn't long before someone came to ask if I was alright and told me it was better to keep moving. I like lying down - it's what I had spent the last 30 minutes looking forward to doing! 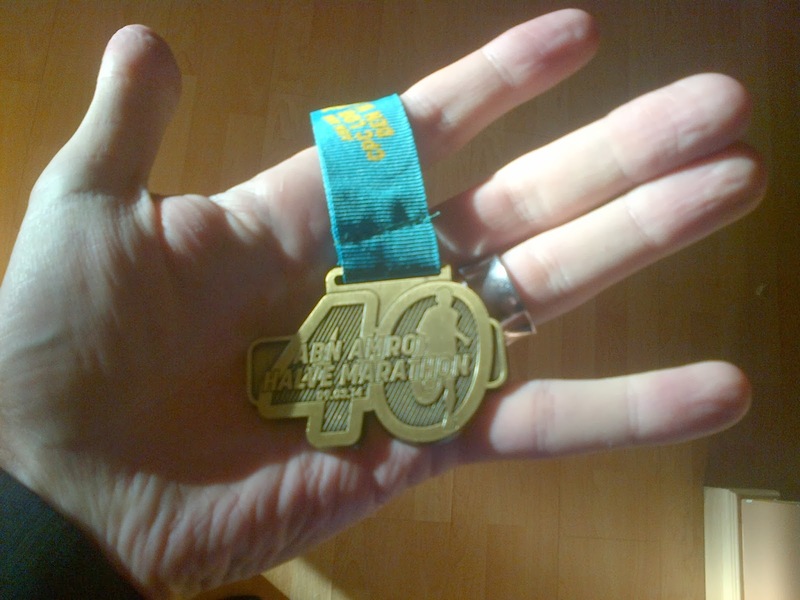 In conclusion, it was a nice weekend but it would have been cheaper and easier to stay at home and to have gone for my personal best time in Getafe Half Marathon (which, they tell me, had an even faster course this year). Now I am going to take a week off running completely to see whether my back can recover completely and then I'll take another week to ramp back up before starting another 9 week plan for the Bupa London 10,000m for real this time!